On a 4th of July afternoon, a northern New York track was alive as the IZOD IndyCar Series trekked to the Watkins Glen International for this year's open wheel event. Competing on the expanded 3.4 mile Grand Prix course, the Sunday Camping World at the Glen held at the 11-turn road course would be the first time in 2 months that the IZOD Indy cars find themselves battling their left and right turns. Taking pole on Saturday, Penske Racing's #12 Will Power returned to his dazzling road course form after four races of oval racing where the Australian experienced more difficulty than the first four road courses. Power led a 1-2-3 Penske Racing performance in qualifying with Helio Castroneves and Ryan Briscoe assembling themselves in a position to atone for Penske Racing's NASCAR Sprint Cup late race collapse at Daytona the previous night. Starting on the slower but harder Firestone black tires, the Penske Racing group started the race confident to run at the front. In first laps, Briscoe's #6 found his way around Castroneves' #3 with the first non-Penske Racing challenge on the top-3 wouldn't come until lap 4. Starting on faster, softer red option tires, the Target/Chip Ganassi Racing pair of Scott Dixon and Dario Franchitti ran down the 3rd place running Castroneves pressuring the Brazilian at one point with a three-wide passing attempt. While the #3 Penske Racing car averted the aggressive Target cars for that instant, Dario Franchitti's #10 car would find his way around Helio Castroneves on lap 6 with Franchitti's #9 teammate of Scott Dixon eager to follow. Through the Esses Dixon thought he saw a chance but ended up colliding with Castroneves. Damaging the #9 car's right front wing plate and the puncturing the left rear of the #3, both cars would continue the race but their early race pit stops required both teams to fall off sequence with the field. Ultimately ending up as a disadvantage dropped them down the leadership late in the Camping World at the Glen running, Helio Castroneves would assess blame to Dixon in post race as "..a little impatience by the #9." Several newcomers to the 2010 IZOD IndyCar schedule were featured at the Camping World at the Glen race. Starting his first race of the year, Paul Tracy took over the Dreyer & Reinbold Racing #24. Just missing the field for the Indy 500, Tracy's presence at Watkins Glen comes weeks before two races in Canada which he is guaranteed to be a favourite. In this preparation event with the #24 team however, Paul Tracy his way up from 12th to 9th at lap 4 but was dealing with an ill-handling race car deeper into the run which erased those early gains. While the Dreyer & Reinbold Racing crew were able to get the race vehicle more to Tracy's liking later in the race but lost too much distance to become a factor within the event. However, Paul Tracy did have a spirited bout with former A1 Grand Prix driver Adam Carroll. Driving a 5th Andretti Autosport car, team driver Marco Andretti helped the driver get noticed to driver this race as well as the upcoming Mid-Ohio round. On lap 17, a spin and stall by the #4 car of Dan Wheldon brought out the race's first full course caution. Many drivers pitted to the attention of their pit crews with the #9 of Scott Dixon being one exception to lead the race with #8 KV Racing Technology car of EJ Viso and the FAZZT Race Team #77 driven by Alex Tagliani following, each running on different pit stop strategies. Once the race restarted, the #8 and #77 would pit 6 laps later leaving the participants of the early race incident Dixon and Castroneves in the top-2 spots. As the continued, the #9 and #3 would pit returning the lead to the #12 of Will Power by lap 32. Following the previous year minor upset victories, the #2 HP de Ferran Dragon Racing team car piloted by Raphael Matos was delivering a strong mid-race emergence from 9th starting spot. In past runnings of the Watkins Glen IndyCar round the race was highlighted by the performance of incredible drivers behind the wheel of non-superteam cars. In 2008, Ryan Hunter-Reay drove to a fierce victory in the last full season of the Rahal-Letterman Racing outing. Last season, Justin Wilson delivered another minor upset to win the race for Dale Coyne Racing delivering the popular long-time owner his first win in top open wheel series. The efforts of Matos in the 2010 Watkins Glen race was complicated since lap 17 when his car's telemetry system malfunctioned. Ending up with a convincingly brilliant finish of 4th at the end, team president Gil de Ferran was quick to credit everyone when the de Ferran Dragon Racing team for the season-best run. “First, the engineers made some great decisions overnight and the crew made the car reliable. Second, we have been struggling lately with pit stops, but the crew was flawless today and even gained us a position on one of the stops. And last but certainly not least, Rafa drove a champion’s race today. He was calm, cool and collected. He was extremely fast all day, running at the same pace as the leaders and attacked when he needed. In short he was flawless and drove a really smart race." Since winning the Indy 500 Rookie of the Year award, Swiss driver Simona de Silvestro has been involved in a fire-filled crash at Texas and another terrible run at Iowa Speedway. Hoping to turn her fortunes back on the road courses would not allow de Silvestro to escape the recent streak of poor runs. At Watkins Glen, he #78 car slid through turn 8 on lap 40 and collided with the inner Armco barrier when she attempted to countersteer through the slide. Alright physically, de Silvestro remarked afterwards "...I tried to make up too much time. I made a mistake." Finishing 24th, this race is one the rookie and the Team Stargate World/HVM Racing organization will be working to put behind them as they head for the Toronto Honda Indy. On what would be the Camping World at the Glen's final restart, Ryan Briscoe led Will Power out of the pits but the #12 of Power immediately put pressure on Briscoe's #6 car before reaching the bus stop. On lap 46, the #10 car of Dario Franchitti moved past Ryan Briscoe through the bus stop as he then mounted a challenge to Will Power. Looking good early for giving Target/Chip Ganassi Racing a fourth victory at the Watkins Glen IndyCar race, Franchitti would only fall within a second of the #12 on two separate laps. Admitting his used too much of his tires to get up to second place, Dario Franchitti would fall back into the clutches of Ryan Briscoe through the final lap passing the worn #10 car on the frontstretch through the final lap. Taking victory for the first race since St Petersburg, Will Power drove a quiet, dominant race to keep him out front in the #12 Penske Racing car. Briscoe, Franchitti, Matos and the KV Racing Technology #32 of Mario Moraes rounded out the top-5 at the line. Scoring the majority of points, Will Power pads his lead for the IZOD IndyCar Series overall standings as well as for road racing points total for the newly-named Mario Andretti Trophy. 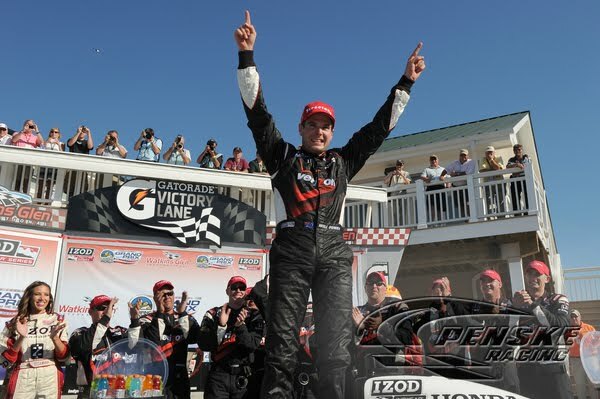 As the Penske Racing team finished their celebration at Watkins Glen, the race enters 2011 as a question mark. Presenting a struggle for attracting fans and corporate hospitality, the IZOD IndyCar Series is unlikely to award a fourth of July weekend date next year. Unlike the NASCAR Sprint Cup Series which has heavily-invested corporations ready to sure up Coke Zero 400 hospitality to the event, the IZOD IndyCar Series is struggling to find companies and people willing to work through the July holiday weekend leading many rumours to assume the race is at least going to be moved elsewhere in the 2011 schedule. Other suggest the venue will leave the IZOD IndyCar tour altogether next year.